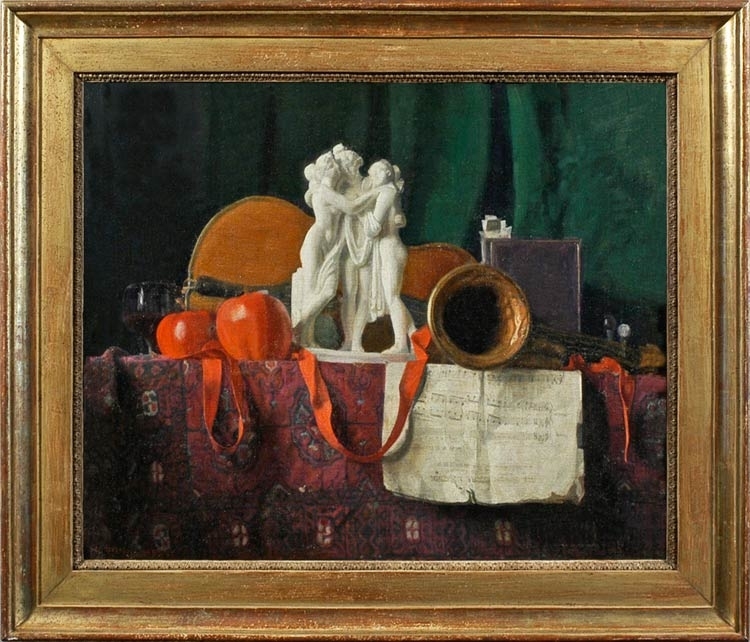 Another composition by Weissbort which refers to a painting by Chardin: this time the large Still life with attributes of the Arts (versions in the Hermitage Museum and Minneapolis Institute of Arts). This is an ambitious homage to a rich and complex work, orchestrating a number of items into a pattern of line, form, colour and texture which will echo the harmonies of the earlier picture. Chardin’s work uses attributes of the visual arts (painting, architecture, drawing, metalwork and sculpture) in his group of items, with the medal of the Order of St Michael prominent (the highest honour for an artist). Weissbort’s work celebrates the aural arts, with musical instruments, sheet music, and a statuette of the Three Graces who seem to listen to music, and to be about to dance. Terpsichore, the muse of dance, usually carries a lyre, whilst Euterpe, associated with music, has a double flute, the equivalent here of Weissbort’s trumpet and viol; whilst the Muses when dancing often have flying ribbons or scarves. Chardin’s painting is full of rich earth colours, lifted by scarlet and deep blue; Weissbort’s is softer, with warm deep reds and russets against a dull teal ground.